We live in a hyperconnected world. Artificial Intelligence and Machine Learning have replaced Big Data as the buzzwords of 2016. If I hear AI I think of movies like “HER” or “Moon” or “2001: A Space Odyssey”. But, AI is reaching a tipping point from being the focus of clever movie plots to a tangible business reality. This is thanks to the access and the ability to crunch petabytes of data and the low cost of high power cloud computing. Gartner already predicted last year that “by 2018, 20% of all business content will be authored by machines”. 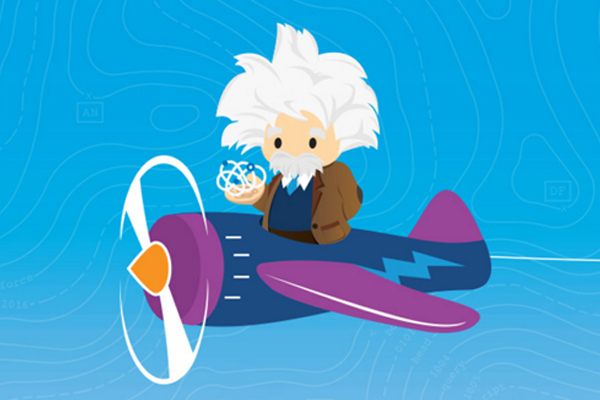 What does Einstein mean for our customers? Powered by advanced machine learning, deep learning, predictive analytics, natural language processing and smart data discovery, Einstein’s models will be automatically customised for every single customer. It will learn, self-tune and get smarter with every interaction and additional piece of data. And most importantly, Einstein’s intelligence will be embedded within the context of business, automatically discovering relevant insights, predicting future behavior, proactively recommending best next actions and even automating tasks.